Nearly a week into the first government shutdown in more than 17 years, most Americans express frustration and concern about the situation. Yet on the core issue dividing Republicans and Democrats in Washington – whether cuts or delays to the 2010 health care law should be part of any budget deal – there is little support for compromise among members of either party. The national survey by the Pew Research Center, conducted Oct. 3-6 among 1,000 adults, finds 44% say Republican leaders should give ground on their demand that any budget deal include cuts or delays to the 2010 health care law. Nearly as many (42%) say it is Obama who should give ground, by agreeing to changes in the health care law. Even when asked if the only way to end the shutdown soon is for their side to give ground on the health care issue, most are unwilling to back down. A majority of Democrats (58%) say it would be unacceptable for Obama to agree to cuts or delays in the Affordable Care Act, even if this is the only way to resolve the shutdown soon. Roughly the same share of Republicans (54%) say it would be unacceptable for GOP leaders to agree to any deal that does not include cuts or delays to Obamacare. Notably, Tea Party Republicans overwhelmingly oppose Republican leaders making concessions to resolve the impasse. 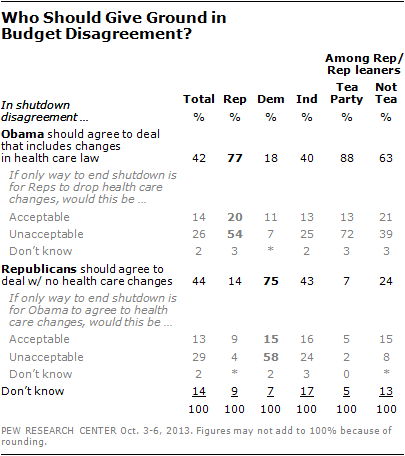 Nearly nine-in-ten Republicans and Republican leaners who agree with the Tea Party (88%) say Obama should agree to cuts or delays in the health care law and 72% think it would be unacceptable for GOP leaders to agree to a deal that does not include those changes, even if it is the only way to quickly end the shutdown. Among non-Tea Party Republicans, 63% say Obama should agree to changes in the health care law, but only 39% feel it would be unacceptable for GOP leaders to drop their demand for health care changes. As other recent polls have shown, there is broad public support for a compromise on the government shutdown when explicit tradeoffs and concessions are not mentioned. Fully 61% say lawmakers who share their views about the government shutdown should be willing to make compromises, even if it results in a deal they disagree with; just 29% say lawmakers who share their views should stand by their principles, even if that means the shutdown lasts longer. Yet finding the middle ground on the issue of cuts or delays to the health care law is clearly more difficult. The survey also finds that Republicans are taking more blame for the shutdown than the Obama administration, but only by a slim margin. By 38% to 30%, more say that Republicans are to blame for the government shutdown than the Obama administration; 19% volunteer that both sides are equally to blame. 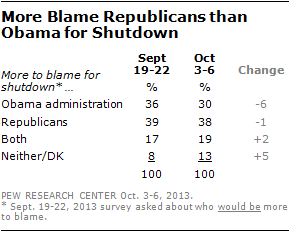 Two weeks ago, about as many said they would blame Republicans (39%) as the Obama administration (36%) if the federal government shut down. Polling in the early days of the 1995 government shutdown was much more lopsided: For example, a Nov. 1995 Gallup/CNN/USA TODAY survey found more blaming Republicans in Congress than Bill Clinton by a 22-point margin (47% vs. 25%). More disapprove than approve of the way that all sides – Barack Obama, Democratic leaders and Republican leaders – are handling the negotiations over the shutdown. However, the percentage disapproving of Republican leaders’ handling of the situation (69% disapprove) is higher than for Democratic leaders (58%) or Obama (50%). Most Americans say they are very (48%) or somewhat (29%) concerned about the effect of the government shutdown on the economy. Only about a quarter (22%) say they are not too concerned or not concerned at all about the economic impact of the shutdown. Majorities of Democrats, people with lower family incomes (less than $30,000), women and older Americans (65 and older) say they are very concerned about the economic effects of the shutdown. 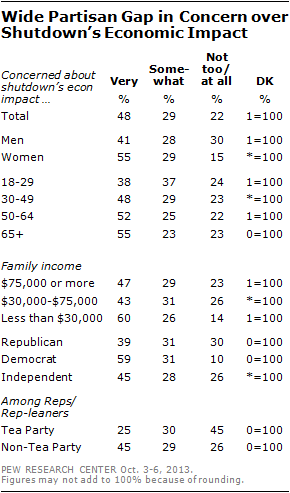 Far fewer Republicans, people with higher incomes, men and young people (under 30) express a great deal of concern. Among Tea Party Republicans, a plurality (45%) expresses little or no concern about the economic effects of a government shutdown. 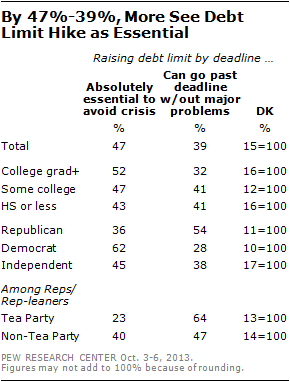 A plurality of non-Tea Party Republicans say they are very concerned about the shutdown’s economic impact. While there are sizable partisan and demographic gaps in concern over the economic effects of the shutdown, there are smaller differences in the percentages saying they have been personally inconvenienced by the federal government shutdown. 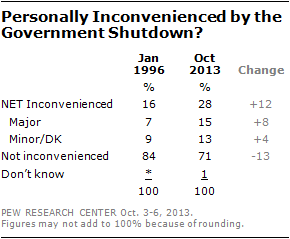 Overall, 28% say they or a member of their family have been inconvenienced, which is far higher than the percentage saying this during the last shutdown of the federal government, in January 1996 (16%). Today, more people across most partisan and demographic categories say they have been personally inconvenienced by the shutdown of the federal government. 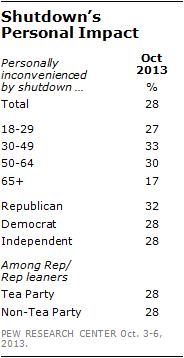 About as many Republicans (32%) as Democrats or independents (28% each) say they or a family member have been personally inconvenienced by the shutdown. About one-in-ten Americans (13%) say they have contacted a public official or signed a petition to express their opinion about the shutdown, while 87% say they have not. Those who are very concerned about the effect of the shutdown on the U.S. economy are twice as likely as those who are less concerned to say they have contacted a public official or have signed a petition to express their views; 18% of those who are very concerned have done so, compared with 9% of those who are less concerned. Similarly, those who say they or a family member have been personally inconvenienced by the shutdown are more likely than those who have not been inconvenienced to say they have contacted a public official or signed a petition (19% vs. 11%). Yet, public officials are also hearing from those who do not want lawmakers who share their views to compromise; 18% of those who want lawmakers to stand by their principles even if it means the government shutdown continues say they have contacted a public official or have signed a petition, compared with 12% of those who want lawmakers to compromise. 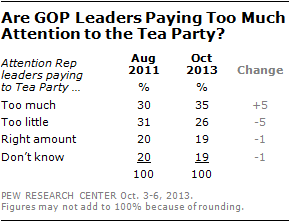 Overall, 35% of the public thinks that Republican leaders in Congress are paying too much attention to the ideas and the positions of the Tea Party compared with somewhat fewer (26%) who say they are paying too little attention; 19% say Republican leaders are paying the right amount of attention to the Tea Party and another 19% do not offer an opinion. This is a modest shift from August of 2011 – following that year’s standoff over the debt ceiling – when as many said Republican leaders were paying too little attention to the Tea Party (31%) as too much (30%). By more than two-to-one, more Democrats say Republican leaders are paying too much attention to the Tea Party than too little (58%-25%). The percentage of Democrats saying the GOP is paying too much attention to the Tea Party is up 11 points since 2011. By contrast, just 18% of Republicans believe their leaders are paying too much attention to the Tea Party; that is up slightly from 13% two years ago. Instead, most Republicans feel the party’s leaders are either paying the right amount (40%) or too little (24%) attention to the positions of the Tea Party. To be sure, the share of Republicans who think the Tea Party gets too little attention has fallen: in 2011 37% thought the Tea Party did not receive enough attention from party leaders while just 24% say that today. Even among Tea Party Republicans this sentiment has waned: in 2011 55% of Republicans and Republican leaners who agree with the Tea Party said their movement got too little attention, compared with 40% today. Yet concern within the GOP that the Tea Party has too much influence remains limited: even among Republicans and Republican leaners who do not agree with the Tea Party movement, more than half say either that the GOP is paying the right amount of attention (34%) to the ideas of the Tea Party or too little (21%). 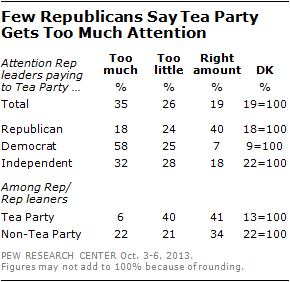 Just 22% of non-Tea Party Republicans say the movement receives too much attention from the Republican Party.